More than 80 cosmonauts and astronauts from 20 countries met with youngsters and members of the public in Minsk, Belarus, during the XXXI Planetary Congress of the Association of Space Explorers (ASE), supported by the United Institute of Informatics Problems of the National Academy of Sciences of Belarus (UIIP NASB) and the national research and education network BASNET. The main objectives of the annual congress are to stimulate interest in science, technology, engineering and mathematics, to attract attention to space exploration and to promote international cooperation. The XXXI Planetary Congress was held in Belarus for the first time, on 9-15 September, with space explorers from Russia, USA, China, European Union and Kazakhstan, as well as scientists and representatives of Belarusian universities and enterprises. The opening ceremony was performed at the exhibition pavilion of the National Exhibition Center ‘Belexpo’. It was attended by President of Belarus Alexander Lukashenko. There was also an exposition on the theme of space exploration, during which participants could familiarise themselves with the history of Belarus and its successes in the field of space research. UIIP NASB, as a body in charge of the implementation of activities in the exploration and use of outer space for peaceful purposes, was involved in organising this outstanding event. In the framework of ‘Community Day’, UIIP NASB was pleased to organise meetings with three astronauts, one of whom is the Official NASA Chancellor at ASE. BASNET organised the infrastructure for live-streams and high-speed connectivity at several locations during the technical sessions. All videos are online. BASNET also supported the Space National Contact Point to organise a great side-event, ‘Space Community Day @ Space’. 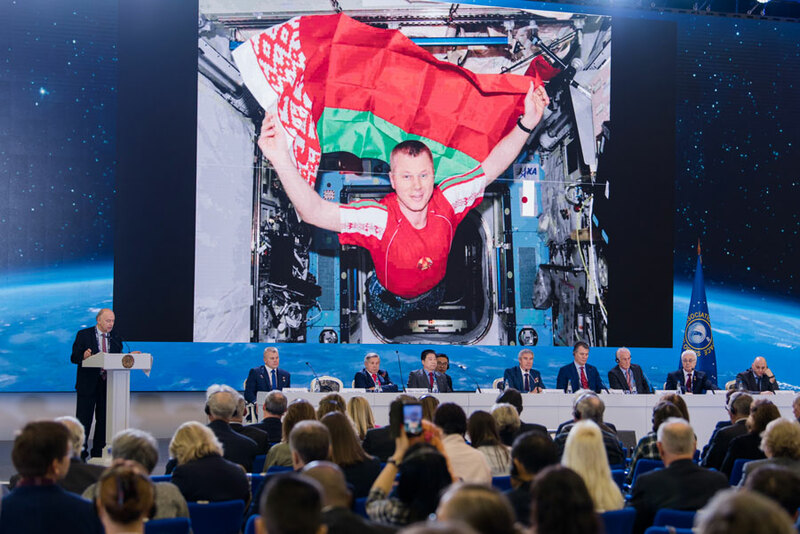 The programme of the congress included sessions, where space explorers shared their experiences and told about space exploration achievements, as well as cultural events, during which participants were acquainted with the cultural and historical heritage of Belarus. Also discussed were Belarus’s inputs to the use of space for peaceful purposes, the latest news from the International Space Station reported by recently-landed flyers, the future of the International Space Station, the Chinese Space Station, and exploration of the Moon and Mars. On Community Day, cosmonauts and astronauts met the younger generation, science and technology communities and the general public, and gave lectures and presentations on their space research. More than 40 locations were included in the Congress including the Botanical Garden, where participants planted an alley of juniper trees. The Planetary Congress of the Association of Space Explorers has been held annually in different countries since 1985. Congress participants – cosmonauts and astronauts – meet to review and discuss developments in their respective space programmes, to evaluate existing ASE programmes and plan future ASE activities. The main Congress objectives are to stimulate interest in science, technology, engineering and mathematics, to attract attention to space exploration and to promote international cooperation. On the Community Day, cosmonauts and astronauts visit schools and universities, meet the younger generation and young specialists, share their experiences with pupils and students – people who are yet to create the future of space. 31 years ago ASE was established by several US astronauts and Soviet cosmonauts, and one of them was from Belarus – Vladimir Kovalenok. Looking from the past to present times there are a row of cosmonauts from the USSR and Russian ROSCOSMOS with Belarusian roots: Vladimir Kovalionok, Piotr Klimuk, Oleg Novitsky, Oleg Artemyev and Anton Shkaplerov. All of them are now good friends and colleagues of UIIP NASB / BASNET.